Apple Stops Calling Its Maps "The Most Powerful"
Following Apple CEO Tim Cook's candid admission that Apple Maps might not be so great, and his suggestion that users turn to competing services, Apple has cleaned up one final detail: they aren't calling their maps the most powerful any more. 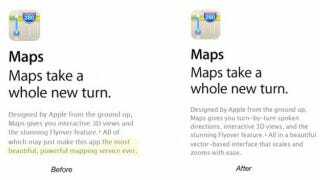 Previously, Apple's website suggested iOS 6 maps were not only the most beautiful, but also the most powerful maps out there saying "All of which may just make this app the most beautiful, powerful mapping service ever." Granted, the statement was hedged a bit with that "may just" part, but apparently not enough because now they've removed the word "powerful" all together. The new description reads "All in a beautiful vector-based interface that scales and zooms with ease."